One of the benefits of writing about vintage Guild guitars is the fact that I get emails about vintage Guild guitars. In this case, I got an email from someone asking if I’d help identify a Guild for sale in a local New Jersey store. I said “sure”, and the person sent me a picture asking if the guitar was a Guild S285 Aviator. 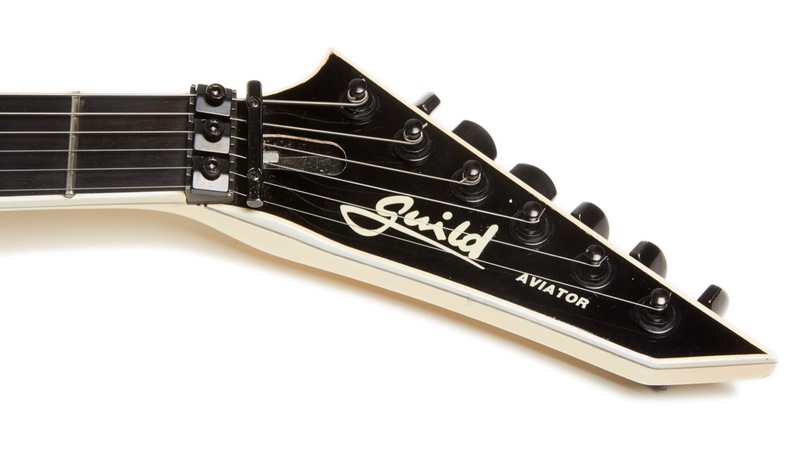 In my years of collecting and writing about Guilds I had never seen a Guild S285 Aviator and only read descriptions of them in books, but even though it wasn’t a perfect match, this guitar seemed like it might be one of those rare beasts. When the potential buyer informed me that he was passing on the guitar he gave me the store information and I made arrangements to pickup the guitar since it was in a store that was less than an hour from my house. My journey of discovery had begun. Was this really a rare S285? Let’s take a look and see what I’ve learned about this guitar and why I call it an S284+. I should start off right away and admit that I can’t prove that this is an S285. It may be an S284 that was custom ordered or it may be some other oddity that I don’t know about and I’ll explain why I think these things as I go along. I will say, though, that if this is not an S285 there’s something about it that’s a fair bit more magical than the two S284s I have. Just what that is I wasn’t quite sure of going in, but I have developed some ideas over the course of the review which I will, of course, share. 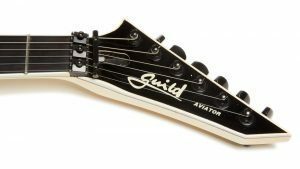 As I stated above, someone emailed me asking if a guitar he had found was a Guild S285 Aviator, and along with that email was this picture. This was a result of me writing the following in my article on the Guild S284 Aviator: The much rarer S285 has binding on the neck and headstock, but I’ve not managed to ever see one of these in person or even online. If you’ve got one please do leave a comment because I’d love to see it! Amazingly, that is exactly what happened. Sort of. Anyway, hooray for the power of the Internet! 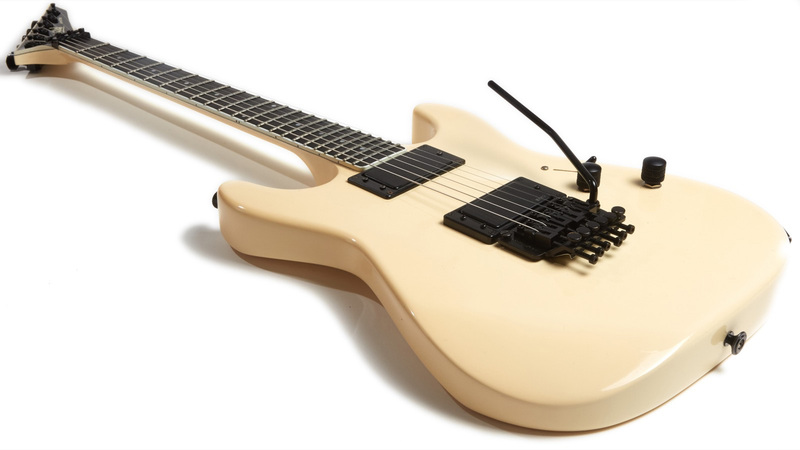 When I saw the picture I got quite excited because it’s clearly got the Aviator body shape with its tell-tale equal-length horns, but it also has the bound fretboard and headstock that is in the description of the S285. The guitar in the picture looks white but the guitar in hand is more of an ivory looking almost yellow in harsh light which you can plainly see in my studio shots. 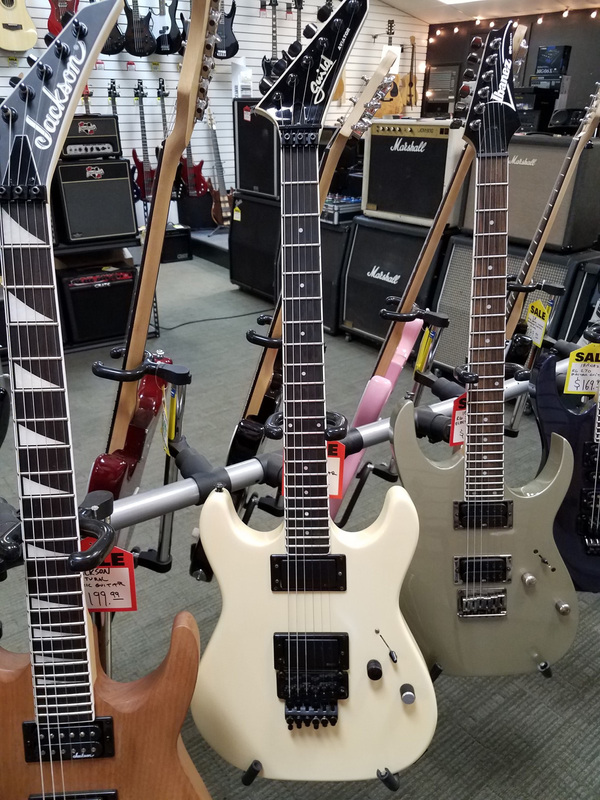 After the person who emailed me let me know that they were passing on the guitar, they told me that it was located at Sussex County Music up on Route 23 North in Hamburg, NJ. I immediately called and asked them to hold it and drove up to check it out the next day where I discovered that it was actually one of the owners who was selling the guitar after owning it for some years. The guitar was in pretty great shape but had some obvious issues like a missing back plate and Floyd Rose arm along with a missing original knob. 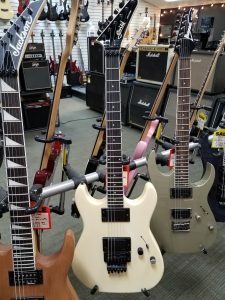 None of those were deal breakers as the guitar played great so I paid for it, spent some time checking out the store (which is worth a visit if you’re in the area – support your local music stores! ), and then scurried on home. 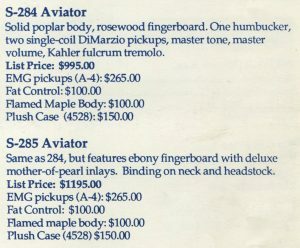 The S285 shows up in the mid-’80s price list with the following description: Same as 284, but features ebony fingerboard with deluxe mother-of-pearl inlays. Binding on neck and headstock. There is precious little information about the S285 out there, but “deluxe” does not really describe the dots on this guitar’s fretboard which is kind of a big red flag in the “not an S285” column. 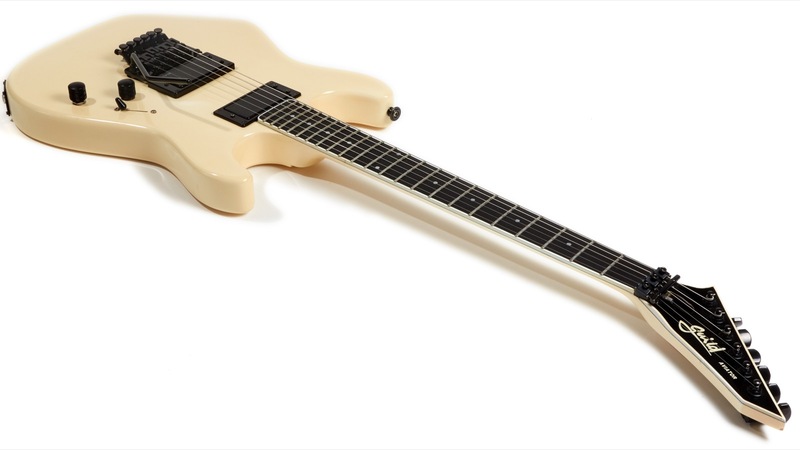 The History of Cool Guitars says that the deluxe S285 was made for only a year in 1986 and that the model included sunrise inlays that I assume to be like the ones on my Liberator Elite (shown here). 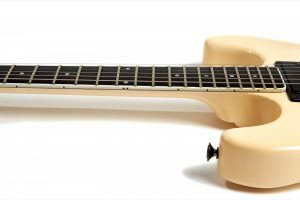 It also says that this model came with a Kahler bridge and a humbucker-single-humber pickup arrangement, though given the wide variation of pickup layouts I’ve seen in S284s, it wouldn’t surprise me to see similar variation in a deluxe model. The Beesly book doesn’t list the S285 model at all. The inlays had me doubting the veracity of this being a S285, though I’d never seen another S285 to compare this one to. 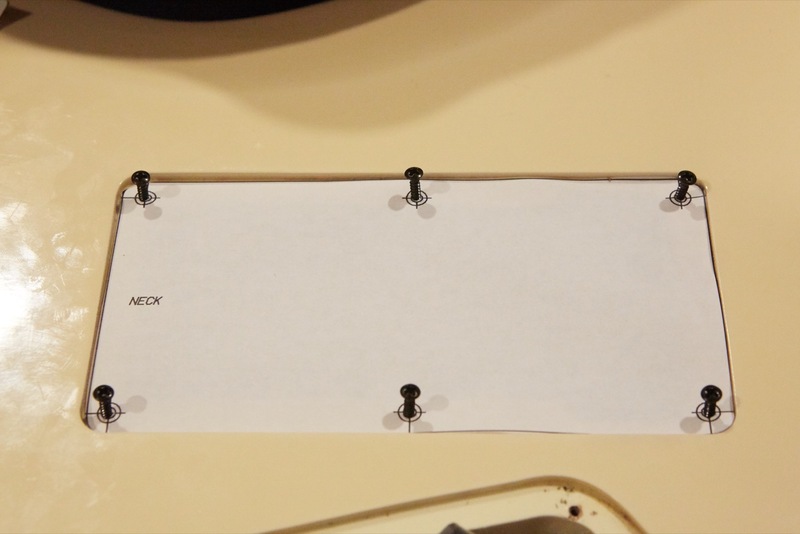 The next clue was the serial number. The serial number on this guitar is HG10048X (last number redacted) which according to the Guild serial number chart makes it an S284 from 1986. 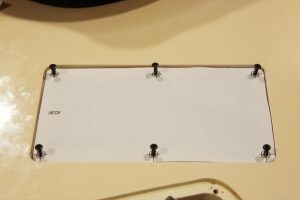 According to that chart an S285 would have a serial number that looks like GK10011 with xx11 being the highest number hinting that possibly only 11 S285s were ever made. That chart is known to have errors, though, so the final word generally comes from Hans and so far Hans ain’t talkin’ which usually means the topic is something that will be covered in the next book he’s writing. That means that I may just have to be patient and wait. I don’t wait well. 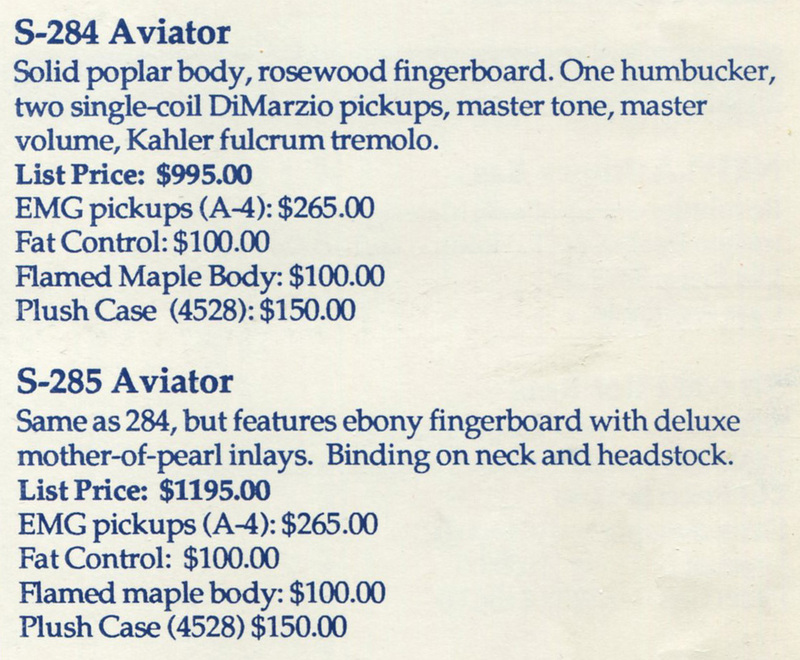 The May 1986 price guide lists the standard colors as Black, Candy Apple Red, Pearl White, and Sunburst, and I’d think this was probably Pearl White though it’s aged to a nice aged ivory color. The picture to the right is from the 1986 Guild catalog thanks to Kurt over at the Guilds of Grot. 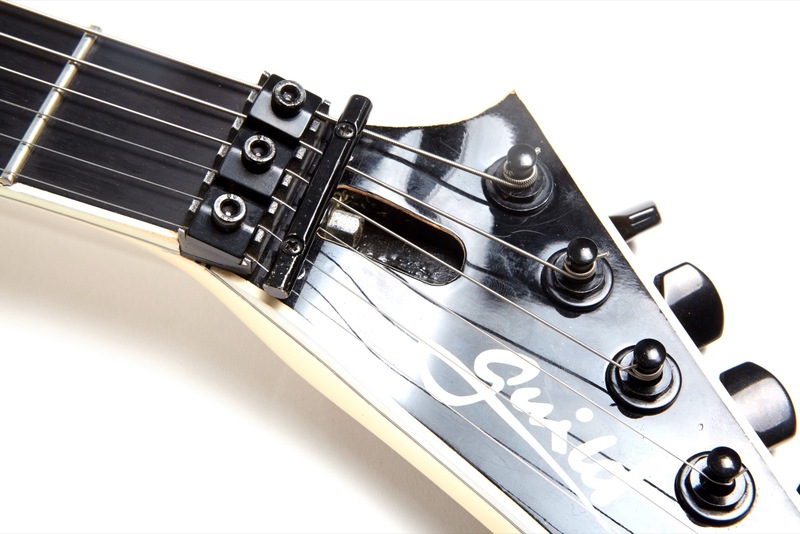 That little headstock peaking in from the side is the only Guild photo I’ve been able to find of an S285 and aside from the truss-rod cover it’s a damn close match to the guitar in this review. The doubts were there, but the guitar was a damn fine specimen that differed pretty significantly from the two S284s I have so I set out to return it to its former glory. This guitar did not come to me in mint condition. 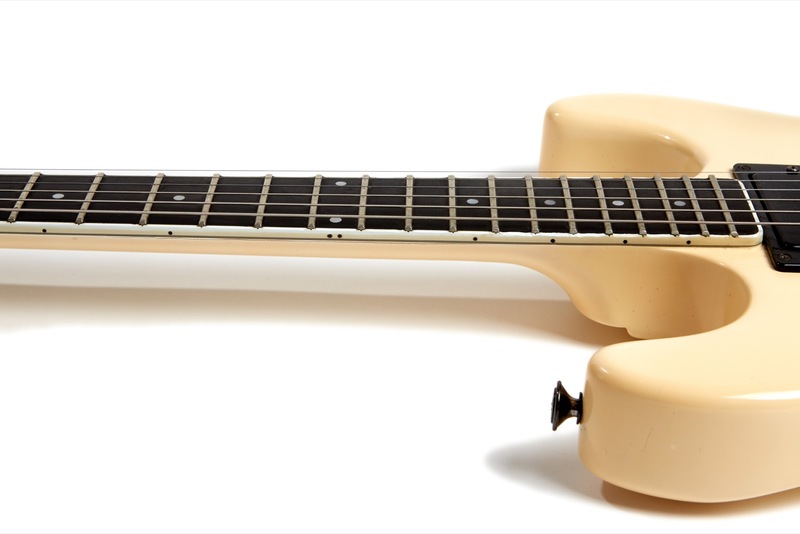 Though the structural parts that matter (the body, neck, fretboard, etc.) were in fabulous shape, the guitar was not without it issues. I had to do some significant work on the guitar including ordering and installing a new custom back plate (the original is long gone), replacing a broken EMG pot (with a period-correct EMG pot that was surprisingly difficult to find), unblocking the Floyd Rose, replacing the missing Floyd arm, replacing two seized fine-tuners, and cleaning about 30 years of grime from the fretboard. The tone pot split in half when I pushed on a proper Guild knob which is something that has never happened to me before. 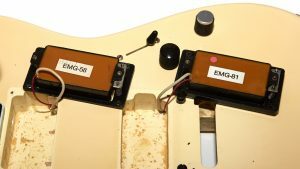 Replacing the pot turned out to be a challange because EMG active pickups use 25K pots and the pots that EMG sells today are nothing like the ones in use in 1986. It took me about a week before I found someone selling original EMG Vol/Tone sets on eBay. What can I say? I have a thing about restoring guitars to what they originally were meant to be and dammit, this one needed parts from the ’80s. The back plate I got from MojoAxe after the owner (Dan) responded to a query I posted on The Gear Page. He was fantastic to deal with and after I sent him a hand-drawn measurement of the plate I needed he sent me life-size templates to cut out and test fit which was a fabulous way to do this. For anyone wondering why I had to go this route, I have over 30 guitars, many with Floyd Rose bridges, and not only did none of the back plates from those guitars fit, but the screw holes on this one were all at wacky measurements making me wonder if the holes were just hand-drilled by eye back in the Westerly Guild plant. To say I’m pleased with the work from MojoAxe would be an extreme understatement. Not only is the fit perfect, but Dan went above and beyond to make sure that I was happy. I could not recommend his work highly enough. 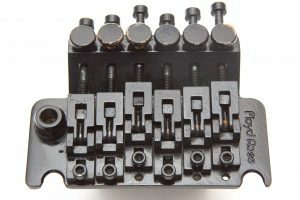 The Floyd Rose parts I bought directly from Floyd Rose and I have to say Kudos to them for stocking parts for long discontinued models. I’m not a fan of the screw-in arms from the ’80s but Floyd Rose still sells ’em! I could have retrofitted a collared arm in place, but remember I like to make the guitar as it originally was. This guitar has a 25 5/8″ scale length making it long scale like a Strat (though technically 1/8″ longer). The fretboard is ebony and the neck is bound as is the headstock which is what excited me about seeing this guitar in the first place. 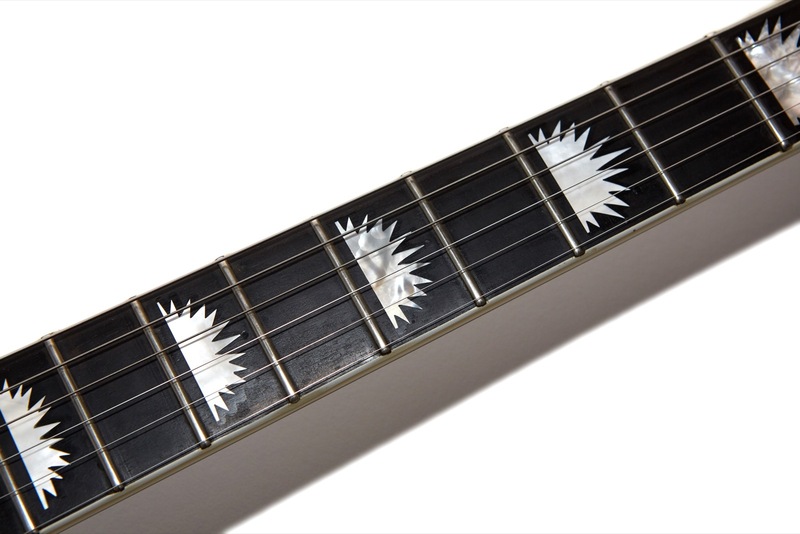 The inlays are dots and while The History of Cool Guitars says that the S285 came with sunrise inlays presumably like the ones on the Liberator Elite, these clearly aren’t those. 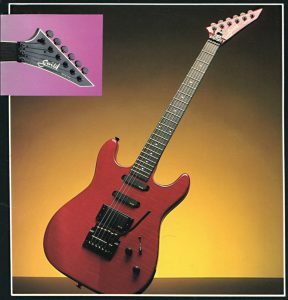 According to that same book which cites Gruhn’s Guide as a reference, only 19 S285s were made in 1986 which doesn’t jive with the often wrong Guild serial number chart. Again, the S285 isn’t even mentioned in Guitar History Volume 5 (The Beesly Book). 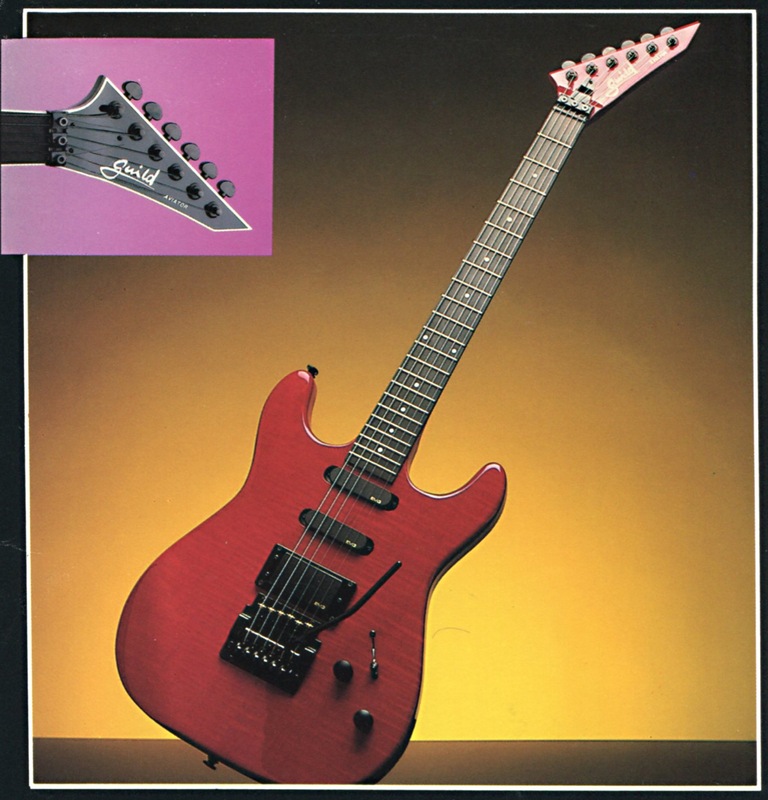 This guitar has a very different headstock shape than either of the the S284s that I have which I believe to be due to the year in which is was produced based on the catalog picture shown in the introduction. On the S284s I have, the shortest side of the headstock angles down from the tuners towards the bottom (the longest side). 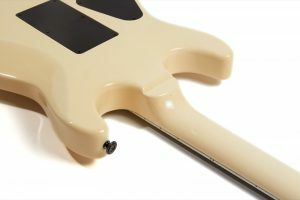 On this guitar the shortest side does exactly the opposite, angling up from the bottom to the tuners (the longest side). The headstock on the other S284s I’ve seen as well as on many other ’80s Guids including the X80 is shown here. I must say that I really like the headstock on this S284/S285/whatever both because of it’s aggressive shape and because of the binding. The contrast of the binding and the finish compared with the headstock veneer is quite striking on this guitar. While I thought that the truss-rod cover was missing, upon closer inspection there isn’t even a hole for a screw to mount one. 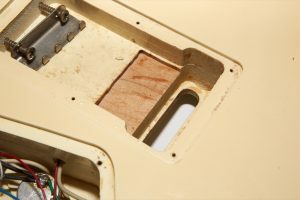 That, coupled with the fact that the inside of the cavity is blacked out makes me think that this may be by design, though it’s possible that this guitar was a one-off or a custom build so there’s no way for me to know for sure. 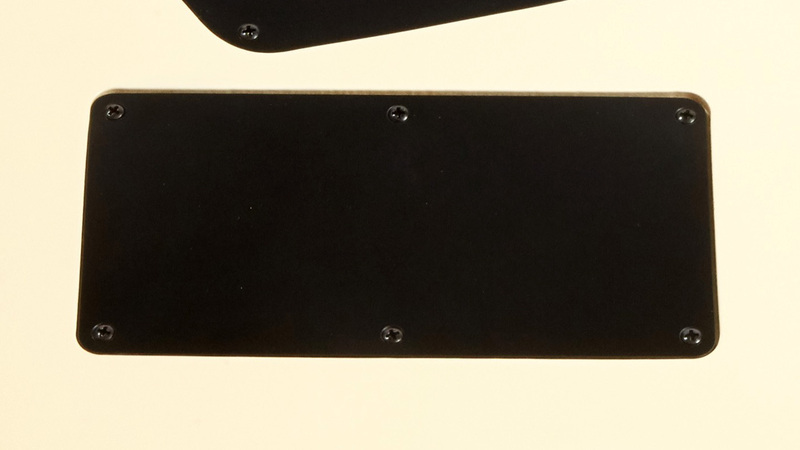 The frets measure in at .04″ high x .105″ wide making them jumbo frets. 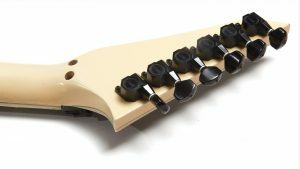 The neck’s width at the nut is 1 21/32″ which is halfway between 1 5/8″ and 1 11/16″ which makes this a great feeling neck for my ’80s-loving fingers, and the neck has a nice depth without being shredder-thin like most of the Ibanez RGs I’ve played. The fretboard radius is a fairly flat 14″ which is a big difference and a welcome change from the curvy 7.25″ I measured on both of my S284s. The shape of the neck, the flat fretboard radius, the bound ebony fretboard and the jumbo frets make this an absolutely wonderful guitar to play, in my opinion, and it is a very different experience compared to my two S284s. The build quality of this guitar is typical Westerly Guild meaning it’s top notch. The neck joint is glued-in or set-neck or whatever it’s called this week, and it’s perfection in every way which makes the guitar feel rock solid and an absolute joy to hold. Some guitars feel good when you hold them and some guitars feel cheap and insubstantial. This guitar feels great and feels much more substantial than some S284s with their poplar bodies and swimming-pool routes. Part of that may be due to me liking heavier guitars as a result of me playing a heavy ash Guild S300AD for many years, but I think this guitar just feels solid whatever the reason. The guitar is quite heavy and weighs a hefty 9 lbs 9 oz (4.33 kilos) which makes me think its maple. Additionally there’s an odd bit of bare wood in the Floyd Rose route that looks like Maple. At first I though this was a block of wood inserted to block the Floyd Rose but it’s not – it’s a small section that appears to have been routed away an addition 1/10th of an inch or so for unknown reasons. Is this guitar finished in Lacquer or Poly? If I had to guess I’d say poly because there’s not a single check or typical bit of lacquer-type wear anywhere on it but I can’t definitively say that it’s poly, either, because I don’t see any of the typical wear-marks of a poly guitar. As I’ve stated many times before, I don’t really care so long as the guitar doesn’t feel like it’s encased in a candy-coated shell which happens to be how I’d describe my 2008 Fender American Deluxe Strat. 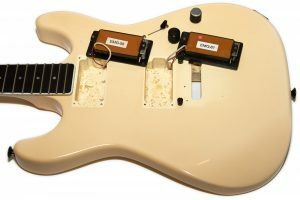 The pickups are both vintage EMGs with the neck employing a gold logo EMG 58. The EMG 58 pickup was one of the first EMG active humbuckers made and has an Alnico magnet. The original 58 was replaced by the model 85 because the 58 was considered to be too noisy. The bridge pickup is a silver logo EMG 81 which is the same as all of the other Guild electrics I’ve reviewed with an EMG in the bridge. 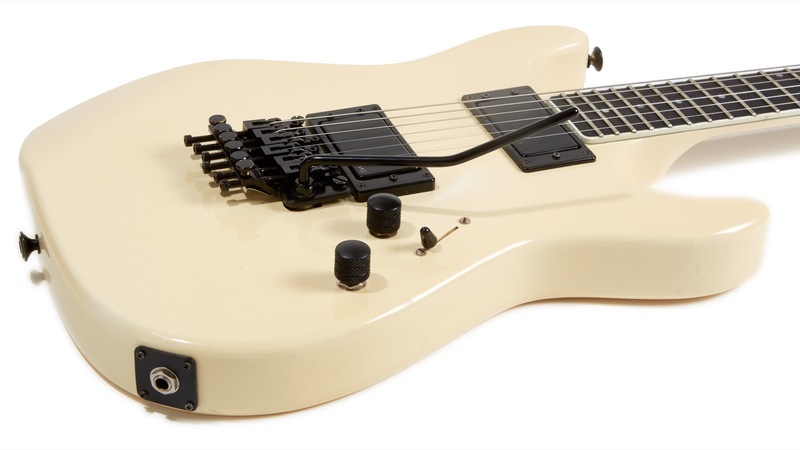 EMG pickups have grown on me since I’ve started collecting and reviewing ’80s Guild electrics, but I generally think that a guitar with EMGs in it sounds like every other guitar with EMGs in it. That’s fine for high-gain where the clarity of the signal is more important than the character of the tone, but no so much for softer rock, blues, or other styles where the player may want more nuance from the guitar. This guitar has got a bit of character that I don’t hear from my other EMG-equipped Guilds. I’m not sure if it’s the EMG 58 in the neck or what, but I like the tone from this guitar more than I expected to. The electronics layout is pretty straightforward with the addition of the blade switch which I find to be an obnoxious addition to an otherwise great guitar. I imagine that since most S284s came with an HSS pickup layout that the bodies were all routed for blade switches so they just used one on an HH guitar, but that’s probably a stretch since this body was clearly not routed for HSS pickups. My dislike of blade switches aside (I really don’t like them), the electronics are not terribly complicated which is a good thing since I had to do some surgery to get it where it needed to be. When I bought the guitar I was warned that something in the cavity was scratchy and they thought that it might be the blade switch. 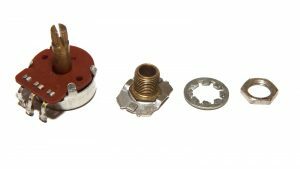 Since one of the first things I did was replace the non-Guild knob with a proper one, and since the knobs are push-on (not set screw), I soon discovered that there was a problem with the tone pot when it basically exploded as I pushed on the new knob. OK, exploded is hyperbole; it split apart into its composite parts. I’d never had this happen to me before, but the tabs that held the top of the assembly simply bent thus allowing the pot to break apart in unnatural ways. 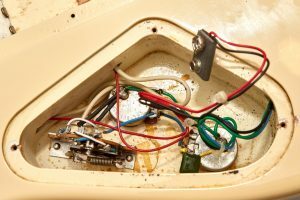 Since I had a broken pot in need of repair and since I’m a huge believer in making guitars as close to their original intended design as possible, I set out to find real 1980s EMG 25k pots which took me about a week of trolling around on eBay. This is one of the few Guild guitars I’ve seen that used more or less color-coded wires and the colors you see on my wiring diagram are accurate representations of the wires seen in the control cavity. With both the volume and tone pots replaced with a proper vintage parts the guitar was ready to rock. The tuners are Guild tuners from the ’80s, and I’m not sure who actually made them if it wasn’t Guild. I actually like these tuners as they work well, are fairly tight (not sloppy) and seem to hold tune well. The knobs are typical ’80s Guild metal dome knobs and luckily I had an actual spare that I could use to break the tone pot which I’m pretty sure was not its intended purpose. 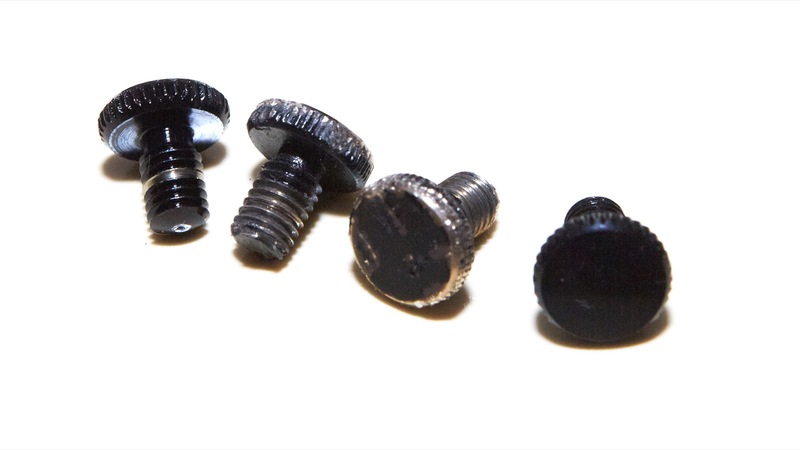 If you’re in a pinch and need to replace one of these knobs, the closest I’ve been able to find are these knobs by JD Metal that I found on amazon. The domes are a bit shinier, but from more than a few inches away you’d never notice the difference, especially if you replace them all. The Floyd Rose bridge is an actual honest-to-Floyd made-in-Germany Floyd Rose and not some import knock-off, so that was a pleasant surprise because nothing beats an original legitimate Floyd Rose. This is not a Schaller, it doesn’t have inserts, and there’s no funny business. I was actually kind of floored when I saw this because Guild usually favors Kahlers and holy crap it’s a real Floyd! This is the first Guild I’ve seen with a Floyd Rose nut that’s attached from the back of the neck, though to be fair it’s pretty uncommon to find a Guild with a Floyd Rose at all and the only other one in my possession at the moment is the rare Libertor Elite which isn’t the best installation I’ve ever seen so I try not to compare to to other guitars except when complaining about that guitar’s bridge installation. I had to replace two of the Floyd Rose fine tuners as they were seized so badly that I had to get them out using vice grips after which the replacements went in and behaved perfectly. Clearly I was not the first person to take pliers to the fine tuners in question as you can see by the completely worn edges of the two removed units (the center two in the picture) which were worn well into the brass. The replacement tuners work flawlessly and I may just go ahead and replace the rest to make them all match, though at this point I’ve been distracted by some other shiny thing so I’ll likely just leave well enough alone. Finally, the output jack on this guitar is on the side which is different than the other Aviators I have. I think this is just a change they made around the time that this guitar was made since I have seen other S284 Aviators with this design all from the later years of the run. The strap pegs are larger than traditional pegs which is a nice touch, but I firmly believe that any guitar played live should have strap locks, so if I were to gig with this guitar that’s what would go on. This a well-built guitar, but how does it sound? I’m guilty of proclaiming that all EMG-equipped guitars sound like every other EMG-equipped guitar, but I think that may be because most if not all of my other EMG-equipped guitars have an EMG 85 in the neck whereas this one has the older EMG 58. This guitar has something special about it. What that something is is up for discussion, though. This guitar has got some extra bit of character that I don’t hear in my other dual-EMG humbucker guitars and that I don’t hear in my other Guild S284, and I’m a bit at a loss to explain why. To be fair, this guitar is built differently than the many other 1980s Guild electrics I have. Almost every other Guild electric from the ’80s in my possession has a Kahler bridge and this one has a Floyd Rose. This one is a big block of maple while those others are mostly all poplar. 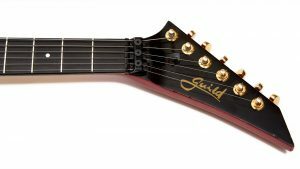 And, of course, this is the only Guild I have with an EMG 58 in the neck position. Whatever the reason, I really like the way this guitar sounds. As usual, for these recordings I used my normal Axe-FX II XL+ setup through the QSC K12 speaker recorded direct into my Macbook Pro using Audacity. I recorded using the ODS100 Clean patch, as well as the JCM-800 and one through a setting called Citrus which is a high-gain Orange amp simulation. For each recording I cycle through the neck pickup, both pickups, and finally the bridge pickup. All knobs on the guitar are on 10 at all times. Most of them are the same simple progressions that I use in all my reviews with the addition of a 12th fret riff with the JCM-800 and a couple of random Citrus recordings just for fun because this guitar sounds really good with an articulate high-gain amp like an Orange RV50 which is what this setting is based on. This guitar has some absolutely killer sustain and I tried to show that in the last recording marked Sustain. Judge for yourself, but damn was this a fun guitar to test. This is a killer guitar no matter how you slice it. 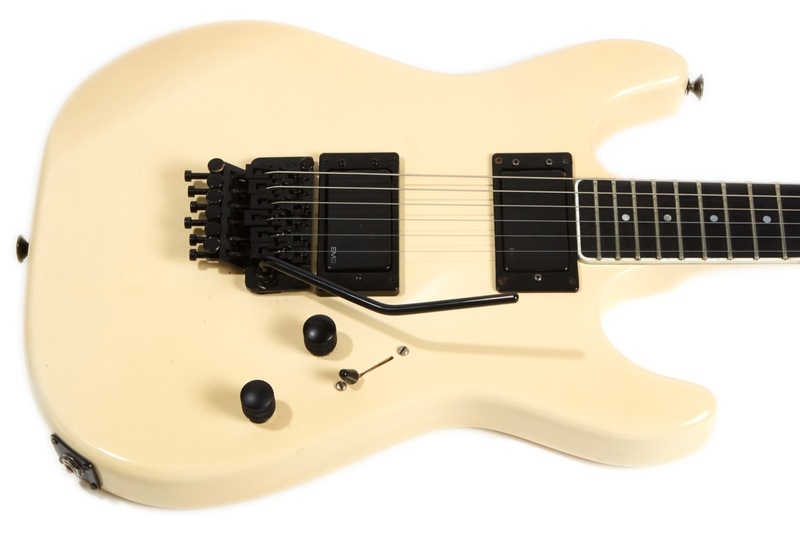 It was made to rock and it has almost all of the features I look for in an ’80s shred machine. Between the nicely shaped and bound neck, the flat radius, the jumbo frets, and the Floyd Rose, I swear this guitar gives my Jacksons a fair bit of competition. Seated, standing, kneeling, or during spinning back-kicks, this guitar plays and sounds amazing, though if you’re going to be doing spinning back kicks while playing I’d advise putting on some strap-locks lest you end up in a YouTube-worthy video wherein you risk destroying such a nice guitar while splitting your pants on camera. My only gripe is that the Floyd Rose was installed in such a way that it can’t be pulled up, but aside from that it’s an absolute dream to play if you’re a fan of the whole Super-Strat thing. Is it actually a super-rare S285? Sadly, I really don’t think so, but it looks like I’ll just have to wait for Hans’ next book to find out. That doesn’t make it any less of an amazing guitar, though, and that’s exactly what this is: an amazing guitar. As I was finishing up this article, a reader sent me an email after reading my S284 post saying that he actually had an S285. Intrigued, I asked for a picture which he supplied. That picture is shown to the right and as you can plainly see, those sunrise inlays are magnificent. Aside from the Inlays and obvious difference in the pickup and output jack layout, this guitar seems to have everything else the S285 has right down to the cool headstock. 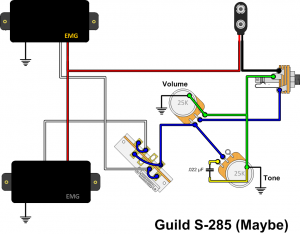 As you no doubt know if you’ve read any of my articles, I love Guild electrics, but I’m not exaggerating when I say that this is probably one of the best Guild electrics I’ve ever played. Whatever the “it” that we guitarists chase is, this guitar has got it, at least for me. I think it may have to do with the neck being perfect along with the bound ebony board, jumbo frets, and a real Floyd Rose. It behaves and feels and sounds like the high-end Jacksons I like so much — you know — the ones that retail for $3000 and up. Did I mention that I got this guitar for less than that? A whole lot less than that. Still, in order to love this guitar you probably need to love playing high-end pointy shredders because if what you lust after is an early ’70s flat-fret tiny-necked Guild, this ain’t the guitar for you. So why is it better than the S284s I’ve played? I think the key elements for me are the bound fretboard, the properly installed Floyd Rose bridge, the lack of a swimming-pool route like on my S284s, oh, and the maple body and neck (my S284s are both poplar). Yeah, I like this guitar better than the other S284s I’ve played, and that’s saying something because I really like my black S284 Aviator. 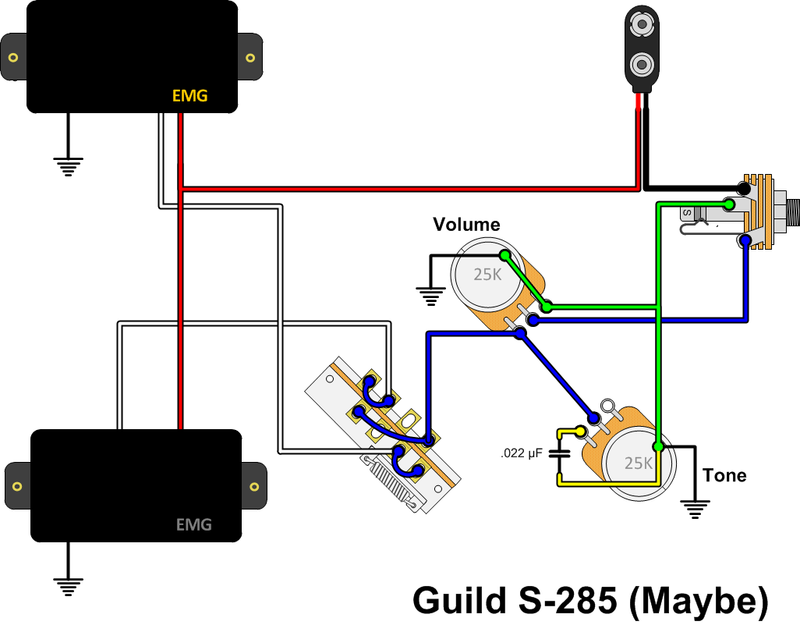 As a result of this one being so different and likely not being an über-rare Guild s285, I’ve dubbed this one the S284+ which has no bearing on what it’s official name may be. The only downside to this journey is that now I’ve seen a picture of a stunning red S285 and now I want one. Until that happens, this seemingly one-off S284 (I assume) with its bound fretboard and headstock is a great way to pass the time. And no, you can’t buy this S284+ from me unless you’ve got a red S285 to trade and even then I’d need to play it first. That’s how great this guitar is. Contact me at gad@gad.net. This guitar is for sale now. I have a black one in great shape and with it’s original case but sadly I don’t really use it so…if anyone is interested in acquiring this rarest of birds let me know and will send info and pictures.